Our Lord Jesus Christ ascended into heaven after promising his disciples the Holy Spirit as their source of power, and instructing them to be witnesses to world. Jesus ascended to heaven and the Holy Spirit descended from heaven to strengthen his disciples. This feast is the celebration of Jesus’ glory after his suffering and death; the glory in which we also hope to share. 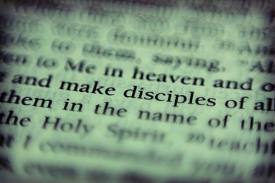 Jesus commanded his disciples to preach the good news and bear witness to the world. ‘’you will receive power when the Holy Spirit has come upon you; and you will be my witnesses in Jerusalem, in all Judea and Samaria, and to the ends of the earth.’’ (Acts 1:8). ‘’Go therefore and make disciples of all nations.’’ (Mt 28: 19). ‘’Go into the world and proclaim the good news to the whole creation.’’ (Mk 16: 15). In these passages, the disciples received instructions to preach the good news with the assistance of the Holy Spirit. As Christians, and by virtue of our baptism, we have been called and commissioned to be evangelizers. Unfortunately, many of us, Catholics Christians are not living up to the expectations of our calling. After the reception of the sacraments we go to sleep as regards our faith. We are not involved in any activities or ministries that would help us demonstrate our faith to the world. Most of us cannot defend our faith when ask, either because we don’t know or we are shy or afraid to speak about our faith as Catholics. The Catholic Church is richly blessed with the fullness of the truth, yet many of us cannot bear witness to all of these riches. Let us renew our commitment to be true disciples everywhere we go, beginning from our families and communities. The second reading tells us that it will not be an easy job. However, we should be happy that we are sharing in Christ’s sufferings and mission. We shall be insulted, ridiculed, misunderstood and hated by others because we are Christians. These shouldn’t discourage us from doing what is right for sake of Christ and his kingdom. We should never allow sufferings, insults or hatred to make us shy away from the truth. We didn’t become Christians because we wanted the comforts and convenience of this life, but because we believe in the truth of Jesus and his church. In spite of the ridicules, misunderstandings and insults, God is still present in the church, and is still using her to perform wonders in the world. Jesus entrusted his disciples with the mission entrusted to him by the father. Despite their weaknesses, Jesus still entrusted them with this great task and sacred duties of shepherding his flock. Our consolation is in the words of Jesus: ‘’I will be with you all the times and no gates of the underworld shall subdue my church.’’ God is still willing to use weak humans being like me and you to do his work in the world. All we need do is to give ourselves willingly and he will make good use of us to make disciples of all nations for his greater glory. The apostles and most of the Jews were expecting a triumphant Messiah. They were disappointed when Christ said he was going to suffer and die. Many Christians also think that by becoming Christians no more sufferings or challenges in their lives. That is not true. There are still sinners, challenges and misunderstandings in the church. The church is not perfect; however, she is constantly working towards perfection. Only God is perfect. We should all join in the struggle towards perfection by participating in the saving mission of the Church. God is calling you today to come and be entrusted with a responsibility in his church; a responsibility to spread the news to the world. Don’t run away and don’t delay, he wants you to suffer with him and bring his salvation to others. Posted on June 2, 2014, in Uncategorized and tagged ascension, catholic, christian, faith, father joel, gospel, holy, holy family of nazareth, irving, jesus, matthew 28, texas, tx. Bookmark the permalink. 1 Comment. Our members could really benefit from this information. Really thought provoking blog post. Please feel free to share your inspiration at Godinterest Dot Com. God Bless Your Ministry.